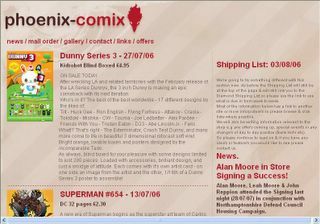 Click on the screen shot (above) to visit the Phoenix Comix site. 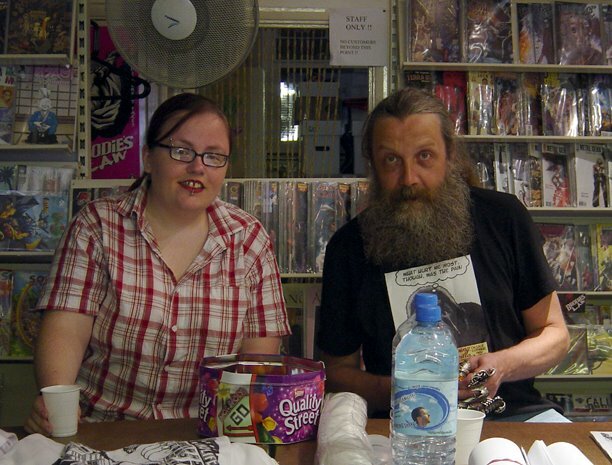 We arrived in Northampton for a quick visit on Friday afternoon only to discover that Alan was scheduled to do a signing for the Northampton Defend Council Housing campaign at his local comic shop that very evening. As it turned out, even Leah and I got asked to sign a few things (including a copy of Wild Girl #1) and the whole thing went really well. For those of you that don't know; Alan has designed a poster which has also been made into t-shirts (pictured below) to be sold to raise funds for the campaign (contact David Horne or Phoenix Comix for info about buying either). Of course, if we paid a little more attention to Rich's Lying In The Gutters, we'd have know about the event weeks in advance. Never mind though, we had a grand old time anyway and, who knows, we might be back to sign there again. Visit http://www.defendcouncilhousing.org.uk/dch/ for more info on the Defend Council Housing Campaign. Sorry for the lateness of this but thank you very very much for attending it was very nice for you to stick around. Maybe we can arange something in the future.